One of Concord Mills’ lucky Facebook fans will be selected at random to receive a VIP family prize-pack to be part of the SEA LIFE Charlotte-Concord Grand Opening celebration. 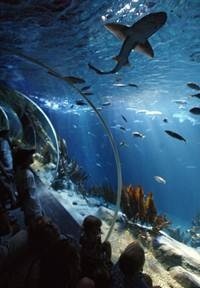 Courtesy of Concord Mills, the largest outlet and value retail shopping destination in North Carolina, this gift package, which is valued at over $1,500, will include dinner, two nights at an area hotel and SEA LIFE season passes for four, plus shopping incentives and other family activities. SEA LIFE Charlotte-Concord’s highly anticipated Grand Opening celebration, which will kick-off at 10:30 a.m. on Thursday, February 20, will feature a ribbon cutting ceremony, welcome speeches, the unveiling of the custom mural painted by area children and a special celebration of Merlin’s 100th attraction. Through Tuesday, February 4, families can visit the Enter to Win tab on Concord Mills’ Facebook page to submit an application for the chance to win an incredible VIP package* to attend this momentous event. One lucky family will enjoy the Grand Opening celebration with four complimentary season passes to SEA LIFE Charlotte-Concord, VIP access to a SEA LIFE Charlotte-Concord preview night prior to the Grand Opening, a two-night stay at the Great Wolf Lodge Charlotte-Concord during the Grand Opening festivities, dinner for four at Jim N’ Nicks BBQ, a $500 American Express® Simon GiftCard® for shopping at Concord Mills, four passes to THE SPEEDPARK at Concord Mills including unlimited rides and mini golf, plus a Concord Mills swag bag filled with exclusive offers from participating retailers and a Concord Mills Coupon Book valued at more than $500 in additional savings. SEA LIFE is the world’s biggest aquarium brand with more than 15 million visitors a year and 50 superb attractions in Europe, USA and Asia Pacific. This will be Merlin’s sixth SEA LIFE Center attraction to open in the USA, and SEA LIFE at Concord Mills will highlight all of the qualities which have gained the brand, the support and endorsement of marine experts worldwide. Visitors will enjoy more than 30 spectacular displays of diverse marine life with everything from shrimp and starfish to seahorses, sharks and rays. *Limit one (1) entry per person. No purchase necessary to enter or win. Not open to residents of Rhode Island. Open to legal residents of the remaining 49 United States and Washington, D.C., that are 18 years of age or older on or before at the time of entry. Void where prohibited by law. Employees, agents and representatives of Sponsors, Facebook, Simon Property Group, its merchants, and their affiliates, suppliers, advertising, prize-sponsoring, or promotional agencies, and the immediate family members of such employees are not eligible to participate. For a complete list of rules and regulations visit www.facebook.com/ConcordMills. Concord Mills is located 10 miles north of uptown Charlotte, at exit 49 off of Interstate 85. Regular hours are 10 a.m. – 9 p.m. Monday through Saturday and 12 p.m. – 7 p.m. on Sunday. For more information on Concord Mills, please call (704) 979-3000 or visit www.concordmills.com. Concord Mills also may be found on Facebook (www.facebook.com/ConcordMills) and on Twitter @ConcordMillsNC.